Most projects fail, especially enterprise software acquisition and implementation projects, because companies don’t understand how a new software system will be expected to fit into their company as a whole. Most companies continue to allow sellers (consultants, ERP vendors and solution providers) to tell them how their business should operate and work by imposing a buying process that’s over 45 years old and is a root cause for failure. The traditional buying process is based on a sellers experience and expertise selling and implementing some enterprise software system. After all these years and the experience of sellers and implementers the question still remains; why does the failure rate for these kinds of projects continue to exceed sixty (60) percent based on all the accumulated experiences from so many experts, the books and articles they’ve written, and the billions of dollars companies have invested to failure proof enterprise software acquisition and implementation projects since 1972? The reason is really simple to understand. It’s because companies continue to initiate these kinds of projects using a buying process that’s over 45 years old. Companies still use the traditional buying process for enterprise software systems because they believe they don’t have the capabilities or skills to evaluate and acquire an enterprise software system—especially ERP. This thinking is wrong-headed because its only companies themselves that can determine and describe the business requirements a software system must have, or allow to be done if their business is to run as it should. If a company wants to ensure success in any kind of project, especially enterprise software acquisition and implementation projects, it must go through the steps to describe and document how their business operates and works—business transaction by business transaction. An approach that delivers a statement of work (SOW) sellers must work from to sell their services or product. Adaptive Growth’s sells an inexpensive and unlimited use license for companies to describe and document how their business operates and works. The work can be stored in a reusable and maintainable database so the work only has to be done once for projects to acquire and implement enterprise software systems, for business process improvement strategies, new market discovery, product design, or improving a company’s day-to-day operations, but is not restricted to them. Our approach is implemented by people within a using company who understand how their business operates and works, better than any consulting firm or software seller ever could. The value of our approach: It describes and documents how a business operates and works—business transaction by business transaction. The deliverable derived from completing the work of our approach is a statement of work (SOW). The SOW is presented to consulting firms, internal or external software architects and developers, or software providers to ensure they know precisely what the company expects from a software technology project. The smaller and more local a software replacement project is, the more important it is to identify its business context precisely, to describe the software’s scope and requirements in terms of the overall flow of work within the company – almost all of which will be external to the software itself. The narrower and more limited the scope of the software, the greater the extent to which the business requirements that software must fulfil will lie outside the boundaries of the software itself. The benefit of our approach: It’s in completing the work of how a company’s business operates and works—business transaction by business transaction. This work only has to be done once because the results can be stored in a reusable and maintainable database. The reusable database ensures the using company it’s always ready for new projects it may initiate—software or otherwise. 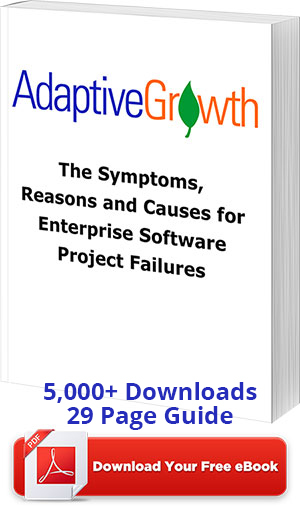 Adaptive Growth’s approach is based on the experience the authors gained from their forty plus years selling, implementing, developing, and customizing business software for manufacturing and distribution companies. Adaptive Growth’s solution to software acquisition and implementation failures is carried out by companies themselves; it does not require the dependency on an outside consulting firm. Adaptive Growth’s solution for software technology acquisition and implementation projects is a departure from the traditional buying process that has been imposed by sellers (consultants, ERP vendors, and solution providers) on buyers over the past 45 years. It prevents the failure syndrome that results from the dependencies sellers foster in their selling methods or consulting methodologies. Our approach is unique in the specific kind of statement of work (SOW) it delivers that ensures all the critical expectations for a project are documented as business requirements in all its phases and is specifically designed to keep the buyer in control of all phases of the buying and implementation processes. This approach is radically different from traditional enterprise software buying processes that sellers, consultants, ERP vendors and solution providers, have used since 1972. We contend that 70% of enterprise software evaluation, acquisition, implementation, and development projects continue to address the functionality of some software system’s applications versus a company’s critical expectations documented as business requirements for all phases of a project. This has nothing to do with some software system or its functionality. This fact continues to be the cause for the high failure rate for these kinds of projects. The reason is most companies don’t dedicate the time and resources to understand how their business works as a whole. The result of not knowing how a business operates and woks as a whole misses what are the project’s critical expectations and documenting them as business requirements for all phases of the project.